The thought of making small talk with complete strangers makes some of us break into a cold sweat. It can feel so awkward, but it’s nearly a requirement at holiday season events like office parties, family dinners and gatherings with friends. You don’t have to dread your next holiday get together. Make the most of it with the following tips on how to schmooze like a pro, and have fun doing it. A moment often arrives at a party when you find yourself completely alone. Maybe your host has moved on to other guests, or you’ve returned from the bathroom. And there you are, standing alone staring at the group of partygoers. What do you do now? Are there any faces you recognize in the crowd? Even if it’s someone you don’t know well, such as a co-worker you briefly met from another department, or a family member from out of town, you still have something in common that you can start a conversation around. Is anyone making eye contact with you? This is usually a good sign, whether the person is standing alone or in a group. Try to smile at the person, and if they smile back, take that as an invitation to approach and introduce yourself. Whereas, two people standing shoulder to shoulder or groups in tightly closed circles are likely not open to newcomers. If you don’t see an opportunity to approach anyone in the main group, try looking for ways you can offer to help. Maybe you can serve drinks or appetizers, take photos or hang coats. These will all give you opportunities to socialize, and may be easier ways to break the ice with people you don’t know. Once you’ve approached someone, start by making comfortable eye contact, holding out your hand and introducing yourself. A simple, “Hi, I’m Erin” is all you need, with a firm handshake. At an office party, you could share what area you work in. Or at a friend’s gathering, you could say how you know the host. It’s a good way to start finding things in common with another person. A party is not an appropriate place to make negative comments about work, complain about family members or spout your opinions on controversial topics. Especially when you’re amongst people you don’t know very well, it’s easy to accidentally offend someone. If you’re really stuck, keep a few of these conversation starters in mind. Do you have any plans for the holidays? Are you traveling anywhere? How do you feel about New Year’s resolutions? Will you make any this year? What was your favorite part about this past year? Did you have any favorite holiday traditions growing up? You may be tempted to come to an event late to keep your visit short, but arriving on time can have its benefits. There will be less people and activity at the start of the evening, which will make it easier to have conversations. And if you’re really not enjoying yourself once the party picks up, it won’t be as obvious if you leave a little early. Everyone has seen you from the start, so your host is unlikely to be offended if you slip out in the middle of the event. Remember there’s always a reason you’re at a holiday event, whether it’s an office party, a family dinner or another get together. 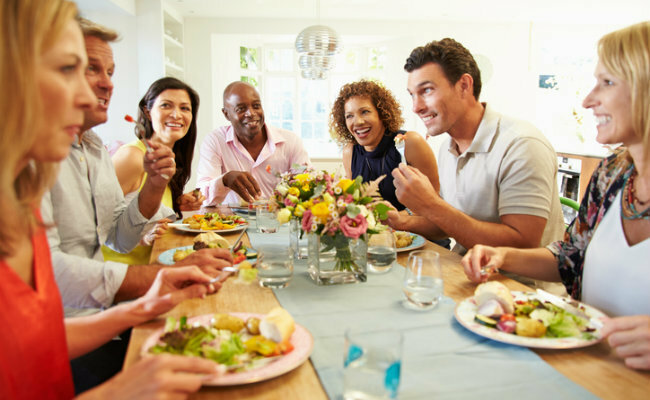 Staying engaged and mingling with the other partygoers can strengthen work, family and social relationships, which can have many far-reaching benefits down the road. Using your phone during a party can quickly kill many of these opportunities. It’s an all-too-easy way to avoid interacting with people when you’re feeling anxious. Your phone should be turned off for the duration of the evening, and preferably left somewhere safe far away from you, like locked in your car. This will prevent any temptation to check it during down times. Perhaps a conversation is going places you really don’t want it to go. Or maybe you’ve seen someone else you’d like to speak to instead. Whatever the reason, it’s alright to politely end a conversation with someone and move on at any time. A good way to wrap up a conversation is to make a comment about the topic, say the person’s name and gently part ways. For example, you could say something like, “It was great to hear about your ski vacation, Rob. I hope we’ll meet on the slopes one day. Enjoy the rest of your evening.” Then you can shake hands if it’s appropriate, and move on. You’ll likely know when it’s a good time to leave the party. You’ve spoken to most of the people there, activities are winding down, you might be starting to feel a bit bored or other attendees are starting to leave. Don’t hesitate to prepare your exit. Say your goodbyes to other partygoers, retrieve your coat, thank your host and head home knowing you now have the skills to make it through your holiday social events with ease. Just spreading the word- "All environmental problems become harder - and ultimately impossible - to solve with ever more people." - Sir David Attenborough. From 1930 the world population has risen from 2 to over 7.6 billion today. We are destroying the world`s natural habitats at an astounding rate, mostly for food production. Our roads, hospitals, schools, and houses are increasingly cramped. Resource usage per person increases every decade, while our total numbers continue to rush upwards. ALL energy efficiency gains go towards accommodating ever-increasing numbers of people. >>> Also, ANIMAL AGRICULTURE is responsible for up to 91% of Amazon destruction and is used to grow food for billions of suffering factory farmed animals. FACTORY FARMING IS DEVASTATING THE ENVIRONMENT, causing extinctions, ocean dead zones and pollutes more than all other industrial sources combined. You are not an environmentalist nor an animal lover, if you eat meat.